“Brad” was often the response at will call to the question “Who left the tickets for you?” Patrons meant headliner Brad Paisley. First Niagara is really a home game for the Glen Dale, W Va. native, who grew up seeing shows there, and a fair share of his devotees is usually comped for his annual appearance. 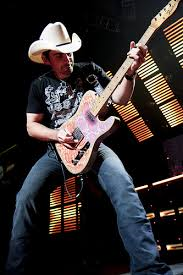 Saturday night was only the second stop on his new Country Nation World Tour. Still touring behind 2013’s Wheelhouse,” there is plenty of material on the 21 track disc. Ironically, he featured very few numbers from it and instead delivered a majority of older hits that are right in his, and his fans’ (well, you know). He showed why he is known as country’s best shredder by opening with a scorching version of “Moonshine In The Truck.” The speed picking clinic would continue for the remainder of the evening with various Telecasters falling victim to his lighting fast fretwork. He walked through the aisles to perform an acoustic mini set on a B stage to the lawn. He pulled out John Denver’s “Country Roads” for obvious reasons. The evening was full of local references to the delight of 21,000. From referencing his own John Marshall high school to substituting “Steeler tattoo” in the chorus of “Tics” he equally pleased both factions from opposite ends of Route 18. In a relatively short period of time, Paisley has gone from a youngster sitting on the lawn at the Coca Cola Amphitheater at Star Lake to rocking the stage at First Niagara. Talk about same place, different story. Not bad for a West Virginia boy. Newcomers Charlie Worsham’s banjo and Leah Turner’s bluesy voice were well received in the pre-opener slot and Randy Houser got the crowd fired up with his unique country rock.